Protesters picketing Detroit Police headquarters demanding the abolition of STRESS in February 1973. Courtesy of the Detroit Free Press. Ricardo Buck, Craig Mitchell, and Gino Fortune were hanging out on the steps of the North End Family Center, a local community center, when they encountered STRESS Officer Richard Worobec working undercover. Photo by Soraya Shockley. Ricardo Buck was 15 years old when a STRESS officer killed him. Courtesy of Jacqueline Beaird. Mayoral candidate John Nichols speaks while Coleman Young, his opponent, waits his turn at the Detroit Economic Club luncheon in October 1973. Courtesy of the Detroit Free Press. Police commissioner John Nichols and state senator Coleman Young in September 1973. Courtesy of the Detroit Free Press. In order to secure the support of black voters, Coleman Young visited several black churches during his campaign. When Patrina Chatman first heard Coleman Young speak, it was at the Shrine of the Black Madonna, a Pan African Orthodox Christian Church, on Linwood Avenue. Photo by Rob Szypko. Richard McKnight, right, was John Nichols’s campaign coordinator. McKnight recalls that Nichols was a reluctant campaigner, who felt uncomfortable going door-to-door to meet voters. Courtesy of Richard McKnight. Coleman Young at his first inauguration in January 1974. 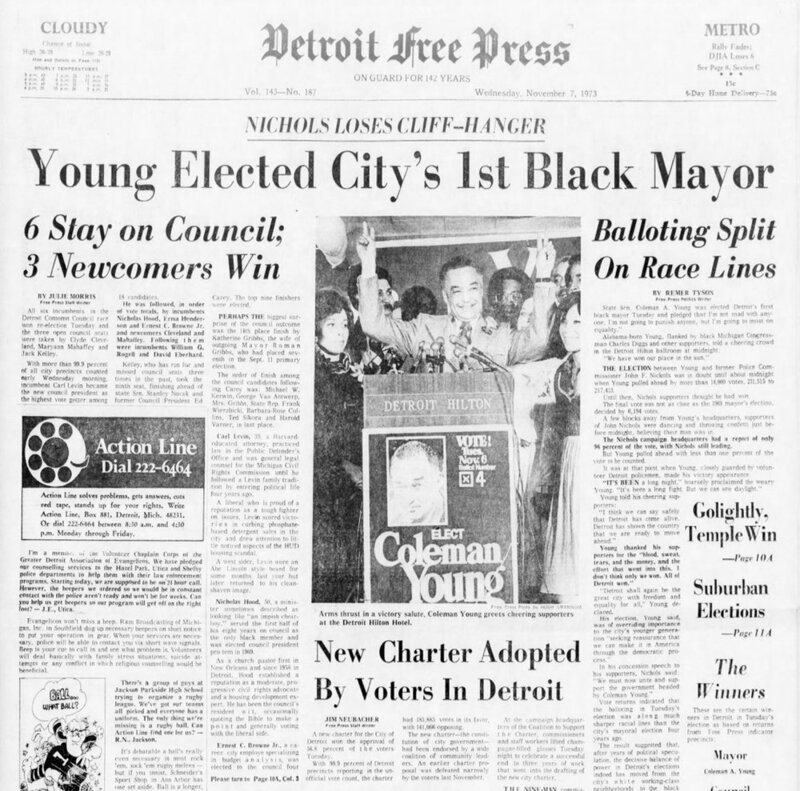 Young was Detroit’s first black mayor. Courtesy of the Detroit Free Press. Coleman Young flashes the victory sign at his 1974 inaugural ball at Cobo Hall. Diana Ross performed at the event. Courtesy of the Detroit Free Press. The interview with Richard Worobec in this episode appears courtesy of David Van Wie's documentary “Detroit Under STRESS.” To learn more about David's film and find out how to watch it, visit detroitunderstress.com. 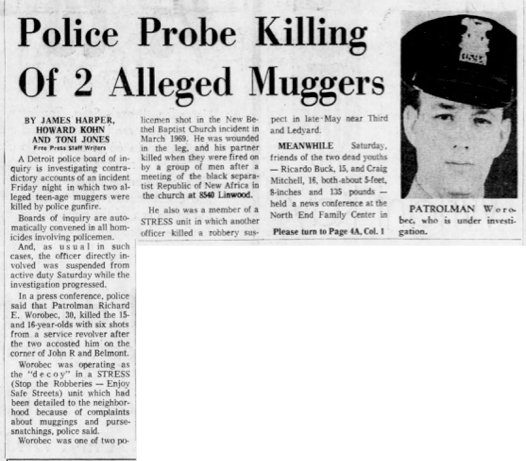 Crimetown is Marc Smerling and Zac Stuart-Pontier. It’s produced by Rob Szypko, Soraya Shockley, John White, and Samantha Lee. The senior producer is Drew Nelles. Editing by Marc Smerling and Zac Stuart-Pontier. Editing help from Alex Blumberg and Caitlin Kenney. Fact-checking by Jennifer Blackman. This episode was mixed, sound designed, and scored by Kenny Kusiak. Original music this season composed by Homer Steinweiss. We recorded some original music at Rustbelt Studios in Detroit in partnership with Detroit Sound Conservancy. Special thanks to Carleton Gholz and Maurice “Pirahnahead” Herd. Additional music by John Kusiak and Kenny Kusiak, and additional mixing by Bobby Lord. Our theme song is “Politicians In My Eyes” by Death. Our credit music this week is “Still in My Heart,” written and performed by Detroit Soul Ambassador Melvin Davis. Archival research by Brennan Rees. Archival footage courtesy of the Shrine of Black Madonna of the Pan African Orthodox Christian Church, the Walter P. Reuther Library at Wayne State University, and the Charles H. Wright Museum of African-American History. Show art and design by James Cabrera and Elise Harven. To learn more about STRESS, check out Mark Binelli’s piece “The Fire Last Time” in the New Republic. Thanks to the Detroit Free Press, Peter Bhatia, Jim Schaeffer, Mary Schroeder, Mary Wallace, Melissa Samson, the Detroit Historical Society, Sheila Cockrel, Barbara Rose-Collins, Gail McKnight, Jacqueline Beaird, Jaramogi Menelik Kimathi, Kehinde Briggs, everyone at the Shrine (including the choir), Larry Mongo, Kirk Cheyfitz, Erin Henneghan, Elliott Hall, Mayer Morganroth, and everyone who shared their stories with us. Detroit is an amazing place, and we’re honored to tell a small part of its story.